We’d love your help. Let us know what’s wrong with this preview of The Asperkid's (Secret) Book of Social Rules by Jennifer Cook O'Toole. The Asperkid's (Secret) Book of Social Rules offers witty and wise insights into baffling social Being a teen or tween isn't easy for anyone but it can be especially tough for Asperkids. Jennifer O'Toole knows; she was one! This book is a top secret guide to all of the hidden social rules in life that often seem strange and confusing to young people with Asperger syndrome. 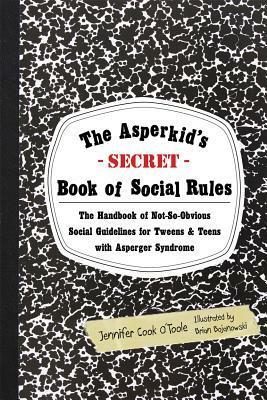 To ask other readers questions about The Asperkid's (Secret) Book of Social Rules, please sign up. Though the title says asperKID, this is useful for aspies of all ages. There are a lot of rules in here that made me go huh... so that's why people do that. I never really knew or understood the reasoning behind a lot of these odd little social things that people seem to do. While I don't follow 100% of the rules outlined, I do agree that if I did it would help me navigate the NT world a lot easier. I know if sucked up my sensory issues and shaved my legs and wore makeup for example, I woul be mo Though the title says asperKID, this is useful for aspies of all ages. There are a lot of rules in here that made me go huh... so that's why people do that. I never really knew or understood the reasoning behind a lot of these odd little social things that people seem to do. While I don't follow 100% of the rules outlined, I do agree that if I did it would help me navigate the NT world a lot easier. I know if sucked up my sensory issues and shaved my legs and wore makeup for example, I woul be more 'accepted' as a female member of society. One thing the book doesn't stress enough that I have learned is Choice - you can understand what some of the rules are and choose not to follow them anyhow. As a parent of a child with ASD who is nearing teenage years I have read quite a few Asperger-themed books both non-fiction and fiction. Up until now the supreme bible/support has been Tony Attwood's The Complete Guide to Asperger's Syndrome but if your child is approaching adolescence this is the ideal book for parent and child to share. Life for my son and other Aspies is like being thrust into a foreign land with no knowledge of the local dialect/customs or culture - something which would frea As a parent of a child with ASD who is nearing teenage years I have read quite a few Asperger-themed books both non-fiction and fiction. Up until now the supreme bible/support has been Tony Attwood's The Complete Guide to Asperger's Syndrome but if your child is approaching adolescence this is the ideal book for parent and child to share. Life for my son and other Aspies is like being thrust into a foreign land with no knowledge of the local dialect/customs or culture - something which would freak out most of us NTs (supposedly "normal" neurotypical folk). Things NTs take for granted like when to say thank you, how to greet others, how to control potential melt-downs, how not to verbalise every thought in our head without censorship are explained here in a structured, easy to navigate guide. My son has learned a great deal about hierarchy within his class group (alpha-males, queen-bees etc) by dipping into this and whilst it might still seem nonsensical to him the way his class mates act at least he has a concept of why they're "play-acting" and he too can play along in order to be accepted. Bought this one for the 13-year old after careful consideration of several different options. There's a lot that I really like about this book. First and foremost, it's written by someone on the spectrum for kids on the spectrum. It's not meant to be for parents or teachers or adults (although seriously, there are several pages I'd like to print and frame and hang around my office); it's written for tweens and teens, which is great. I like how logically it's laid out, how easy to read, and how n Bought this one for the 13-year old after careful consideration of several different options. There's a lot that I really like about this book. First and foremost, it's written by someone on the spectrum for kids on the spectrum. It's not meant to be for parents or teachers or adults (although seriously, there are several pages I'd like to print and frame and hang around my office); it's written for tweens and teens, which is great. I like how logically it's laid out, how easy to read, and how non-judgmental the advice is. It walks through, step-by-step, in an orderly fashion, really important issues like when and how to say "thanks" and "I'm sorry" and how to tell if someone is really your friend. There are even helpful practice sessions in the back. These are life-lessons that I (and I assume most people) had to learn the hard way, through trial and error, and it's lovely that someone thought to write it down in such a readable, useful format. My three complaints: 1) I dislike the term "Aspie" and she uses it. A lot. All the time. Always. 2) The "I like someone" section is geared exclusively for heterosexually oriented people. 3) There is much reference to getting help from trusted adults, but not a good discussion about how to determine whether or not an adult is, in fact, trust-worthy. O’Toole, Jennifer C. (2012). The Asperkid’s (secret) book of social rules. Philadelphia: Jessica Kingsley Limited. Content/Scope- Begins with a list of 125 ‘need to knows’. Ranges from making friends and social rules to hygiene and social space. Also lists helpful websites and books. Accuracy/Authority/Bias- The author worked as both a social worker and a teacher in special education and mainstream education. She has won awards in her work with Asperger Syndrome. Arran O’Toole, Jennifer C. (2012). The Asperkid’s (secret) book of social rules. Philadelphia: Jessica Kingsley Limited. Arrangement/Presentation- An easy to read arrangement of quotes and advice as well as lists. Accessibility/Diversity- Language that is teen friendly and easy to understand. This handbook can be used by students with Aspergers or to help students understand classmates or family members. This group is underrepresented in most libraries. Relation to other works- The library has two novels and one biography dealing with Asperger’s Syndrome. No reference materials on Asperger’s were found. Timeliness and Permanence – This is a condition that many students deal with and that most students will come in contact with at some point. I should probably give this book a higher rating - it's thoughtful, insightful and well written. I think my feeling about the book is more my own knee-jerk reaction to the reality that the rest of the world is operating on a very different set of rules from me, and I kinda deeply resent that. Universe? Are you listening? I'm not well pleased! In fairness, Jennifer Cook O'Toole has written a really useful book that sheds light on a lot of mysteries about the way social conventions work for the maj I should probably give this book a higher rating - it's thoughtful, insightful and well written. I think my feeling about the book is more my own knee-jerk reaction to the reality that the rest of the world is operating on a very different set of rules from me, and I kinda deeply resent that. Universe? Are you listening? I'm not well pleased! I bought this book several years ago before my son was old enough to read it. It's actually autographed by Jennifer when I met her along with Temple Grandin. I read it then and only recently handed to my son. As a teenager, he is now facing more and more social situations which he frustrate him and this book is one resource he can go to to seek an answer. I read most of this and encouraged my Aspie son to read it one chapter at a time. A book like this would have been helpful for me when I was in high school. Good, encouraging guidelines are offered for every day living and relating to others around the Asper-kid. My son really like this book and found it very helpful. This review has been hidden because it contains spoilers. To view it, click here. Excellent! A must for tweens and teens with ASD . This is a fantastic book for tweens, teens, and adults with Asperger Syndrome. It's also good for other kids who want to understand American social rules better! Definitely a good read for anyone to see what people with Asperger's might need to think about, also works with kids who don't have Asperger's but have social challenges. Lots of useful info for any age, though the chatty style (which wasn't aimed at me) was a little wearing, and almost an obstacle to starting the book. Lately I've been thinking I jumped to some incorrect assumptions when trying to imitate human social interactions, and here are some of them spelled out. Plus more that never occurred to me. Not quite a Missing Manual but a big help. If you look at it and think "but that's just common sense," you're even less the intended audience. Suspended (overd Lots of useful info for any age, though the chatty style (which wasn't aimed at me) was a little wearing, and almost an obstacle to starting the book. Lately I've been thinking I jumped to some incorrect assumptions when trying to imitate human social interactions, and here are some of them spelled out. Plus more that never occurred to me. Not quite a Missing Manual but a big help. If you look at it and think "but that's just common sense," you're even less the intended audience. So far, no social skills book is the encyclopedia that I wish for. I always hope that stuff could be like this one article on flirting I read a long time, where researchers counted the number of eyebrow raises in a bar. This book is actually pretty awesome though. It discusses 7 levels of friendship closeness, and has a couple hundred social rules, 30 or 40 which are discussed in depth.